A famous fantastic mysteries which will captive you, for sure! Sulla is a Legio XIII gladiator. 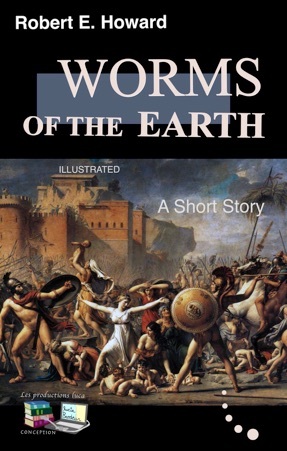 Now on the form of worms, these guys continue the battle since first century AD. You will like this fabulous story! "Strike in the nails, soldiers, and let our guest see the reality of our good Roman justice!" The speaker wrapped his purple cloak closer about his powerful frame and settled back into his official chair, much as he might have settled back in his seat at the Circus Maximus to enjoy the clash of gladiatorial swords. Realization of power colored his every move. Whetted pride was necessary to Roman satisfaction, and Titus Sulla was justly proud. For he was military governor of Ebbracum and answerable only to the emperor of Rome. He was a strongly built man of medium height, with the hawk-like features of the pure-bred Roman. Now a mocking smile curved his full lips, increasing the arrogance of his haughty aspect. Distinctly military in appearance, he wore the golden-scaled corselet and chased breastplate of his rank, with the short stabbing sword at his belt, and he held on his knee the silvered helmet with its plumed crest. Behind him stood a clump of impassive soldiers with shield and spear — blond titans from the Rhineland. Before him was taking place the scene which apparently gave him so much gratification. A scene common enough wherever stretched the far-flung boundaries of Rome. A rude cross lay flat upon the barren earth and on it was bound a man — half naked, wild of aspect, with his corded limbs, glaring eyes and shock of tangled hair. His executioners were Roman soldiers, and with heavy hammers they prepared to pin the victim's hands and feet to the wood with iron spikes. Only a small group of men watched this ghastly scene, in the dread place of execution beyond the city walls. The governor and his watchful guards. A few young Roman officers. The man to whom Sulla had referred as "guest" and who stood like a bronze image, unspeaking. Beside the gleaming splendor of the Roman, the quiet garb of this man seemed drab, almost somber. He was dark, but did not resemble the Latins around him. There was about him none of the warm, almost Oriental sensuality of the Mediterranean which colored their features. The blond barbarians behind Sulla's chair were less unlike the man in facial outline than were the Romans. Not his were the full curving red lips, nor the rich waving locks suggestive of the Greek. Nor was his complexion the rich olive of the south. Rather it was the bleak darkness of the north. The whole aspect of the man vaguely suggested the shadowed mists, the gloom, the cold and the icy winds of the naked northern lands. Even his black eyes were savagely cold, like black fires burning through fathoms of ice. His height was only medium but there was something about him which transcended mere physical bulk. A certain fierce innate vitality, comparable only to that of a wolf or a panther. In every line of his supple, compact body, as well as in his coarse straight hair and thin lips, this was evident — in the hawk-like set of the head on the corded neck, in the broad square shoulders, in the deep chest, the lean loins, the narrow feet. Built with the savage economy of a panther, he was an image of dynamic potentialities, pent in with iron self-control. At his feet crouched one like him in complexion — but there the resemblance ended. This other was a stunted giant, with gnarly limbs, thick body, a low sloping brow and an expression of dull ferocity, now clearly mixed with fear. If the man on the cross resembled, in a tribal way, the man Titus Sulla called guest, he far more resembled the stunted crouching giant. "Well, Fartha Mac Othna," said the governor with studied effrontery, "when you return to your tribe, you will have a tale to tell of the justice of Rome, who rules the south." "I will have a tale," answered the other in a voice which betrayed no emotion, just as his dark lace, schooled to immobility, showed no evidence of the maelstrom in his soul. "Justice to all under the rule of Rome," said Sulla. "Pax Romana! Reward for virtue, punishment for wrong!" He laughed inwardly at his own black hypocrisy, then continued: "You see, emissary of Pictland, how swiftly Rome punishes the transgressor."